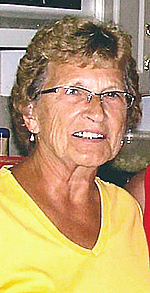 Carolyn L. Borth, age 78, of Fairfax died peacefully surrounded by her family after a short battle with cancer, on Saturday, Sept. 1, 2018 at the Seasons Hospice House in Redwood Falls. Mass of Christian Burial will be 10:30 a.m. on Friday, Sept. 7 at St. Andrew’s Catholic Church in Fairfax. Visitation will be from 4 to 8 p.m. on Thursday at the church beginning with a prayer service at 4 p.m., and will continue one hour prior to Mass on Friday. Interment will be in St. Andrew’s Catholic Cemetery in Fairfax. Kolden Funeral Home of Le Sueur is handling arrangements. Carolyn was born on June 15, 1940 to William and Bertha (Prokosh) Timm in Fairfax. She married Gilbert Borth on Nov. 23, 1957 at St. Andrew’s Catholic Church. Carolyn worked for many years as a Dental Assistant, but her main joy and job in life was being a doting farm wife, mother, and grandmother. She was a member of St. Andrew’s Church serving on various church committees, which included Ladies Aid, and the St. Andrew’s Cemetery board. She volunteered with the Fairfax Depot Association, and was heavily involved with the Doreen Borth Memorial Scholarship. She was always available and willing to help out wherever needed, whether it be within her community or with her family. She enjoyed being a caretaker and friend to many. She took great pride in gardening and keeping her yard meticulous. Carolyn was well loved by all her family and friends. Her sense of wit and honesty will be greatly missed by all who knew her. Most importantly her family is going to miss her famous Christmas Eve Beef Jerky. She is survived by her husband, Gilbert of 61 years; children, Thomas (Karen) Borth of Richfield, MN, Patricia (Gary) Hagemeyer of Marshall, MN, Michael (Ann) Borth of Le Sueur, MN, David (Lori ‘Lods’ Kiecker) Borth of Fairfax, and Janice (Brian) Michelson of Tracy, MN; grandchildren, Ryan (Angel) Bauman, Andy Bauman, Ashley (significant other, Matt) Bauman, Matt Borth, Adam (Tonya) Borth, Derek (Sunnie) Borth, Angela (Bryan) Miller, and Tanner (Amy) Michelson; great-grandchildren, Devine and Damian Bauman, Skylar Borth, Spencer and Trevor Borth, Jadah and Malarie Borth, Amelia and Cameron Miller, and Elise Michelson; and many other relatives and friends. She is preceded in death by her parents; siblings, Donald and Bob Timm, and LaVerna Caven; and daughter-in-law, Doreen Borth.